It’s nothing new to hear Team Lolly crack eggs into the conversation. And not just any eggs, Clarence Court – true royalty in the egg world. We have been helping our delicious client with their social media and digital marketing for some time now (be sure to check out their socials if you haven’t already!) working with the fabulous food photographer, David Loftus, and food stylist, Pip Spence (aka Team Egg) to capture beautiful shots of some truly tempting recipes. This year, the company celebrates their 90th anniversary. We have had the pleasure to design a stylish Look Book in celebration of this milestone, showcasing exactly what they do best. The bespoke undersized A4, hard back book has a linen cover with lightly embossed golden text. Glowing with their famous golden yolks, it features delicious recipes, chef and brand ambassador interviews, their full range of fabulous eggs by fabulous birds, and utterly beautiful photography. 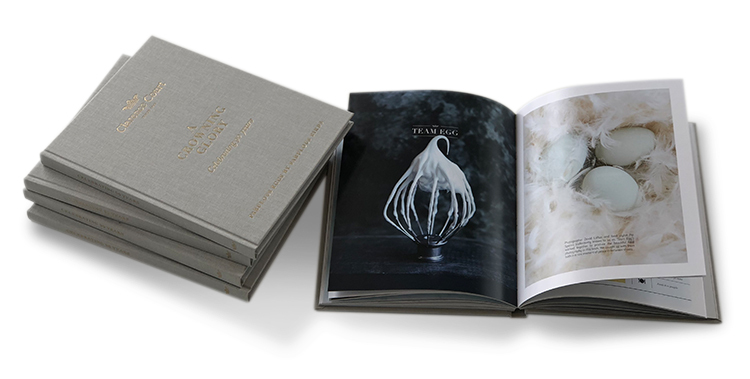 Like gold dust, limited copies have been distributed to industry foodies – press, suppliers, restaurateurs. But as we don’t want you all to miss out entirely, you can try some of the scrumptious recipes featured – sweet and savoury – here.